A book I finished last week...it was so good. I used to be such an avid reader but since I had the two timesuckers and started scrapbooking (OK, my third timesucker) I haven't made the time to do it very often. With the exception of magazines and Dr. Seuss, I've read just a handful of "real" books in the past couple of years. Recently though, I've been trying to read more...a little every night...a little LESS computer time. It's been good and rewarding. Feels like those few braincells I still have left kicking around are being stimulated once again. So anyway, the reason I recommend this book...besides the fact that it's just good storytelling - it really made me want to explore the genealogy of my family. 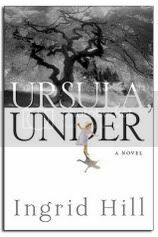 It weaves this tale that goes back centuries and centuries and all concludes with one little girl, Ursula. SO interesting to read about all the nuances of a lineage. I'll admit, I've never really put much thought into the lives of the men and women that preceded me (well, other than those I've known...basically only as far back as my own grandparents. I scrapbook to preserve memories for my children. Occasionally, I'll do a page about myself, Carlos, or some other part of our extended family but for the most part, it's all about the kids. My memories of my own childhood are so sketchy...bits and pieces here and there...no discernible pattern to them...I want to provide my children with the ability to at least have the memories provided to them if they cannot recall the details themselves...perhaps the books will even jog their memories so they experience the moments all over again. The good, the bad...the funny and the sad - all are important in tracing the evolution of a person. But what about all the other people that influence them? EVERYONE is an integral part of their history. And to expand on that theory...what about all of THEIR ancestors that influenced them? Needless to say, I have an itch to do some research. Find out who/what/where/when/why about some of my ancestors. Where did they come from, what did they do, what did they have in common with ME? I want to see how everything intertwined to the point where I came into being. I'm intrigued by the consequences of actions...the fact that if just *one* single ancestor had made *one* slightly different decision, everything would be different. I wouldn't be here in my current form and function...and therefore, neither would my children. How important does it seem now to have an understanding of your history? Long, rambly, nonsensical...yup, that about sums up some of my posts as of late, lol. If anyone has any good genealogy resources to share with me to "get my feet wet" so to speak, please let me know! And really, check out the book - good stuff! I love to read! I'll have to check out this book :) I used to read a ton, then along came John and I went a long time before reading again....but have started to in the last year! I am in a book club (called the "let's get together once a month and maybe read a book club) so it helps motivate me! I got interested in geneaology a couple of years ago when Kellyn had to do a project but just didn't have the time (esp. because of the time spent on here and scrapping) to do a lot. My sil does a TON and has been good about giving info to me when she gets it. My dh's lineage has been traced back to John Adams (president) as well as somebody coming over on the Mayflower! Kind of cool for the kids! Well, you sure joined the right hobby to know about this. Scrapbooking is LITTERED with mormons, and what do we do? Geneology? Drew and I have a GIANT poster in our office of 6 generations out. It's fun to look at all the names (esp. since Drew did all the work). If you go to www.familysearch.org you'll be able to find some resources. THanks for the suggestion- sounds very interesting. while i fully expect to one day be hit with this huge curiosity, i have to say that it in no way interests me right now. matter of fact, i've never been all that taken with the subject. i think it's because i'm a don't look back just keep on goin', kind of mentality...anyway, always love a good book reccomendation so we'll have to see if it peeks my curiosity, no? Hmmm.. sounds suspiciously like something I would blog about, if I had a blog. ;) I used to be such a voracious reader until I had my kids, then, nada. I recently started reading some realllllly fluffy stuff over the summer, and I lapped it up, like i was dying of thirst, kwim? Felt great. Now I have to find something a bit, um... deeper. LOL. The book you talk about sounds great- I'll have to check it out! I would love to do a family tree sometime.. we have interesting origins, lots of countries involved! And my family and I have made plans for the next time we go back to the Philippines. We're going to hunt down as much family as we can and write down as much history as we can. I think we'll be successful if we can go back three generations. At least that's my goal.